The team has been busy working on the next update to Bless Online, and today we wanted to spend some time talking about that update (v1.3.0.0) as it will be released on July 4th! 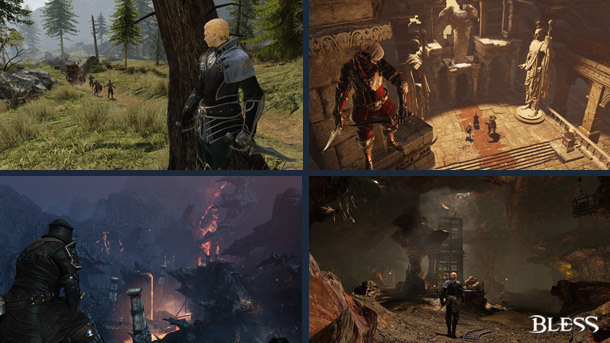 The focus of this update is new end-game content: Royal Quests and Basel Gorge. Royal Quests are a new daily quest series that will be available to characters starting at level 45. Players will be able to find an accept these quests in multiple locations around the world; they will be marked by purple quest icons on the world map. Players will be able to complete a total of 15 Royal Quests per day to get the most rewards possible. These quests have better rewards than regular quests! Not only does each Royal Quest have a higher gold reward than a normal quest, but for every 5 Royal Quests completed each day, players will receive an additional bonus reward via in-game mail. The top tier [Hero] Royal Box even has a small chance of dropping rare pets and mounts. Basel Gorge is the highly contested centerpoint of the conflict between the Union and Hieron factions. As such, it is recommended that players approach Basel Gorge with a party of level 45 characters. Located to the east of where the Siege of Castra takes place, Basel Gorge has many different gameplay elements for players to participate in. There are two main objectives to compete for with the opposing faction; controlling the three neutral bases and killing the various bosses in the Basel Gorge area. 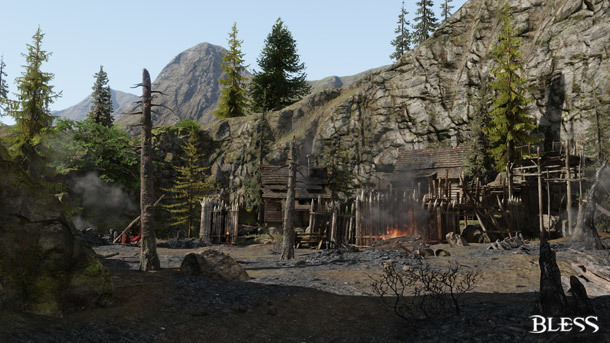 While in Basel Gorge, players are able to gain more Combat Points from engaging in PvP than they would in other open world zones by controlling neutral bases. Gaining control of a neutral base will grant all members of that faction currently in Basel Gorge a “Gorge Occupier” buff. This buff can stack up to three times, once for each neutral base in the area. Each stacked buff grants a 7% increase in movement speed and increases the amount of Combat Points gained from killing another player by 50%, making faction PvP within Basel Gorge extra rewarding. However, keep a close eye on the bases! Once a base is captured, it will only belong to that faction for twenty minutes before it reverts to neutral and can be contested by the opposing faction once again. Basel Gorge is laid out with Hieron in the north and Union in the south. There are also various teleporters and revive points for each faction spread throughout the map. Bosses spawn towards the middle of the area, with some spawn locations being more easily contested by one faction than the other. The bosses players will find in Basel Gorge are more difficult than the typical elite bosses that are spread across the world of Bless. There are also three different rarities of bosses, determined by their respawn time and the randomness of their spawn location. 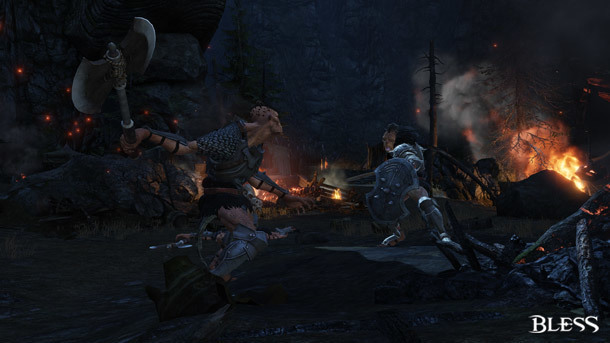 Sak the Hobgoblin Fiend and Murderous Rover Sykeeli are the most common; they are on short respawn timers and will spawn at predictable locations throughout the map. Ensanguined Ursuta and the Giant Malefic Blob are on a slightly longer respawn timer and will appear in one of seven random locations around the map. Last, but certainly not least, Spider Queen Akasys—one of the most challenging bosses in Basel Gorge—is on the longest spawn timer and will appear in one of seven random locations when she spawns. Loot in Basel Gorge works differently than it does in other areas in Bless. Participation in the fight for each boss is calculated to determine the overall contribution of each person in the fight. The more a player participates in each fight, the more Combat Points they will be awarded for defeating the boss. Remember that in Basel Gorge, players are always competing against the opposing faction for credit on boss kills. Loot drops will be distributed via die roll for the faction that successfully takes down the boss. As you can see, there are many ways to enjoy the new Basel Gorge content. Players can choose to fight difficult bosses, attack bases, defeat members of the opposing faction—or even a combination of the three! We hope you all have as much fun with this new content as we do, and we look forward to hearing your feedback on it. Is it normal to get by the 15th Quest - Chest just 2 Gold Ore when the description of the box say it give 6? And some of the Boxes give nothing??? @Deep♂Dark♂Low yep, statistics is a best and, which most important, objective indicator in this case. People are leaving the game one by one, but steadily. it would be better if u just zip your mouth and spare us your ♥♥♥♥♥♥♥t @DanaDDBpro !! show me link Jack Sisina! What do u expect from developers who used translation from Bless english patch made by fans instead of making their own.